In the middle of lobster trap upgrades today, we spotted Phil and Nell aboard Moondancer working to launch their Hobie Cat. Greg immediately set the bamboo stalks and angle grinder down to rip over and help get the new toy in the water. After some tricky manoeuvring and a quick, unintentional dip for Phil, the Hobie Cat was in the water and Phil was off! Once Phil had completed his lap around the anchorage and returned to Moondancer at “ramming speed”, he insisted Gregory try his hand at sailing the trimaran. As Greg ripped around the anchorage his smile only grew. 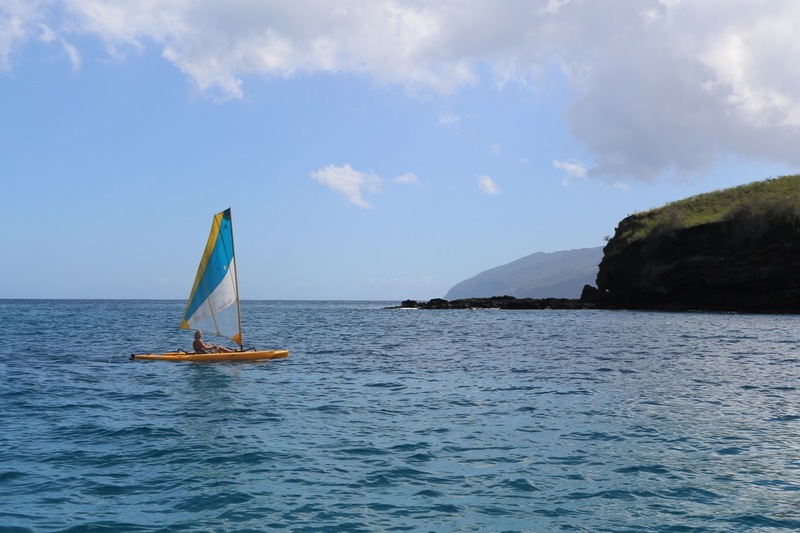 During one pass by Oceanna’s steps I slipped on to the outrigger and shimmied my way over to the cargo spot behind Gregory. 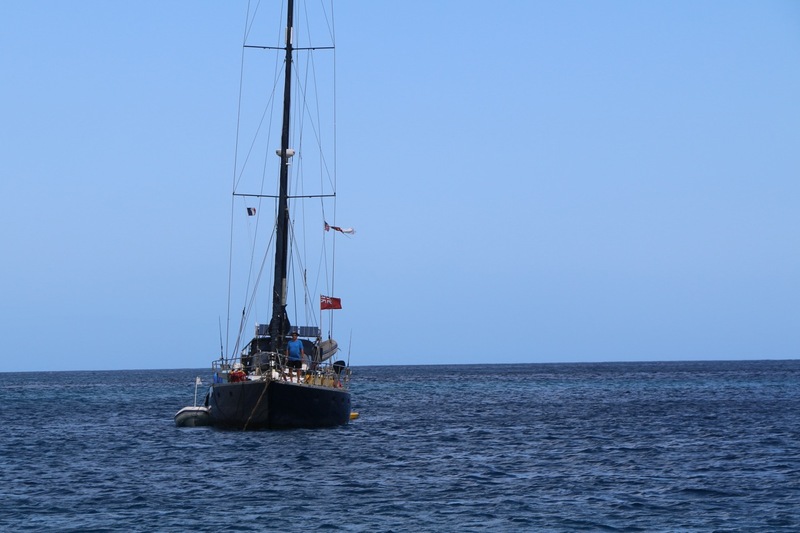 He immediately turned the bows out to sea and we found the consistent winds outside the bay and really started to soar. Back at Moondancer we returned the Hobie Cat and were invited on board for beers. Now if you’re going to spend an afternoon with anyone Phil and Nell are a premium choice. British Phil with his medical doctorate, previous teaching position at Harvard, and complete embrace of the cruisey sailing life; is beautifully matched with his straight-talking, hilarious story-telling, New YoRican (ie: New York/Puerto Rican) wife Nell. Not only were we treated to cold beers, but there was also delectable crab cakes fresh from Nelly’s Deli! Couple that with the great conversation and sweet fish books Gregory is now coveting, it was an afternoon well spent. Regardless of the epic sunburn I stupidly got on my entire back. Cutting new bamboo roof pieces to length for the lobster trap. Ripping around in Phil’s Hobie Cat. Phil checking to see where his boat has gone. 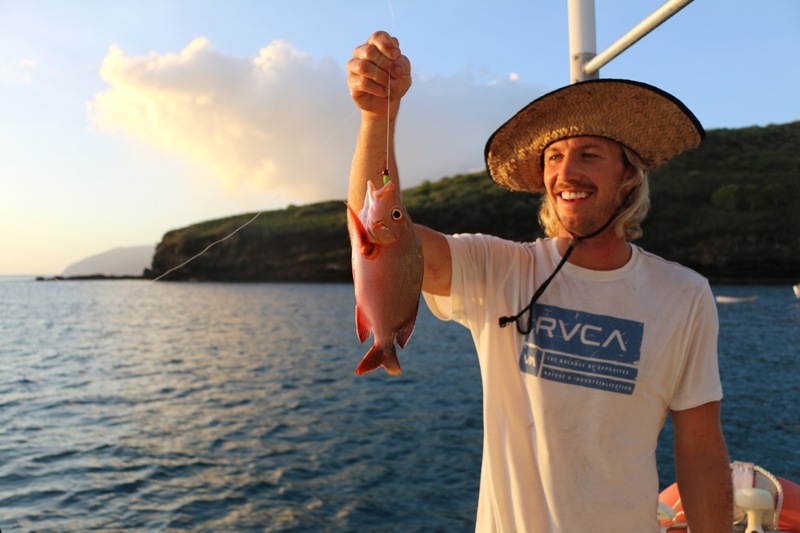 This reef fishing just doesn’t get old. Big YellowFin to hit the decks of Oceanna! Jussi and I were quite stoked on this! Made it back across the equator into the North Pacific! Merry Christmas all! Loving every connotation of this @girlboss post. . Repost: The greatest gift. Art by @subliming.jpg for Girlboss.